If you’ve never planted before and want to have a try with container gardening, that’s wonderful! Here are some tips to start your very own container garden. You can really go all out and purchase self-watering containers in order to grow your vegetables, but you don’t have to. Some people use old plastic tubs, kiddie pools, a wine crate lined with newspaper or burlap, or even five or fifteen gallon buckets purchased from the store. The biggest consideration is to know what you’re going to grow prior to obtaining your containers. Smaller-rooted plants, such as herbs or lettuces can be grown in smaller containers. Larger-rooted plants, such as tomatoes or cucumbers, need more depth and may be grown best in a five gallon container. All containers need a drainage system, so if you are using plastic tubs, you need to drill holes in the bottom in order for extra water to drain. If you have more than one crop in one container, make sure they all have the same requirements for amount of sunlight per day, the amount of water needed and the fertilizer to be used to optimal growth. Here in Rockledge, Florida, we are in the USDA plant hardiness zone 9b. By knowing your plant hardiness zone, you can do some research on what types of vegetables and herbs will best grown in what season. For example, lima beans, sweet potatoes and hot peppers are great summer plants for this area and should be planted mid-June. Most soils and compost materials can be found at the local garden or home center, but it’s important not to use regular garden soil for container gardening. Plain old garden soil is not conducive to good container garden growth. You can make a soil mix with compost, garden soil and some type of sand. 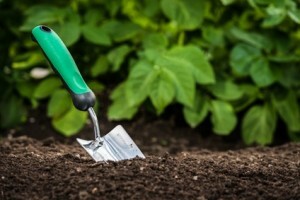 High quality potting soil can also be used if you don’t want to mess with making your own.